MEN, WE NEED YOU!! This book is so important but it has been a bit slow going. If we don't have your stories, the book will never see the light of day! So please send them. There are many, many men out there who need this book, need the story only you can share. No problem. Send your story along anyway! We would love to read it! 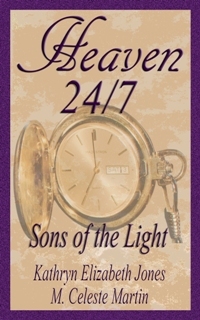 In book two, Sons of the Light, men of all ages will come to understand how they can stay connected to Heaven 24/7. All stories must be based on personal experience and must show evidence of how you are connected to Heaven 24/7. If you have another topic idea not mentioned here, please feel free to share it. We may decide to work your idea into an additional chapter. Idea Creations Press and its editors will choose the stories with the best fit and connection to Heaven 24/7. All authors will be notified, whether or not they have been chosen for the anthology. We appreciate all entries and will give special attention and prayer to each one we receive. All those who have been selected for the anthology will receive a free copy of the book and a coupon code to purchase additional copes at 40% off retail. Submissions may be edited. The author will be notified and will approve a final copy. No changes to said manuscript can be made after author gives their approval. Please, no ranting. This is to be a book of inspiration, not confession. Please, stories from men only. The author will receive no compensation or royalty payments for their work, other than that already specified. Idea Creations Press retains all rights to author's work, and stories cannot be sold elsewhere. Names and relationships can be changed in your story. Please send your stories of less than 1,000 words to: kathy@ariverofstones.com. We will then send you a release/permission form if you are using true names and relationships in your story.